No matter what you write and who you write to, flexible export formats in Inspire gets you all covered. You can export your Inspire sheet to whatever format you want, PDF, DOCX, HTML, MD, TXT, you name it. You can do so via File › Export…. Or the export button ( ) on the left of the editor. Then select the file format and preview your export. If you want to share your work with friends who also use Inspire, just export your sheet as “InspireSheet“. 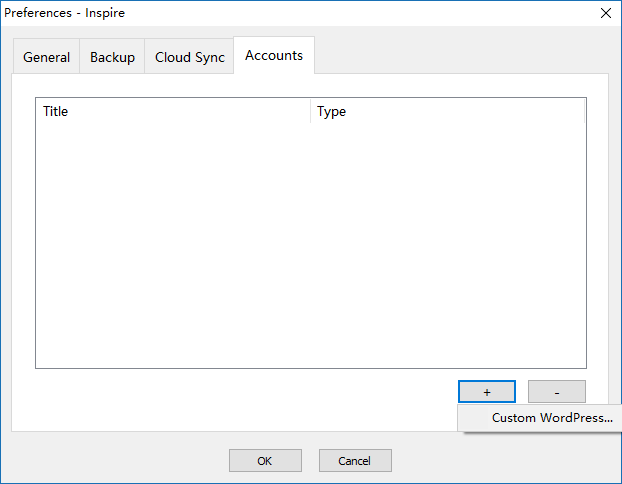 Your friends can import them into Inspire as it is, i.e. with the same styles and all. You can also write your stories with Inspire and directly publish your work to WordPress from within the app. To do so, you need to add your WordPress account via File › Preferences. In “Preferences”, tap “Accounts” and click the “+” button. Add your WordPress account information. Click “Log In“. There you go, all set and ready to go! You can also publish your work to Medium right from within the app. To do so, you can refer to the detail instructions here.